The dog tag is made of stainless steel with the 3D urethane encased design as shown. The dog tag is 2″ x 1.1″ in size and can be engraved on the backside (sorry, we do not offer an engraving service). This item also includes a 24″ black satin cord with a lobster claw clasp. 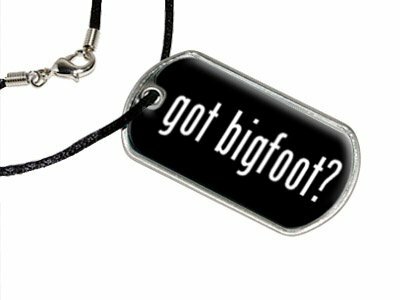 My 10 year old neice loves her got bigfoot dog tag necklace. She proudly wears it to school everyday. It is well made.